The role of CISO, and other InfoSec professionals, has morphed into a critical business function. One should expect getting involved in “business” discussion often, and at higher levels. Understanding and speaking business language is more important than ever for success of any InfoSec professionals. Knowing basic business lingo is also crucial for effective communication inside an organization. Following is a list of basic terms that every InfoSec professional should understand, at least at a basic level. It is a draft list and I intend to update it later on. However, it provides a good starting point. Clicking on the links will take a reader to the relevant Wikipedia pages for more information. Stock Market – If one is working in a public company, knowing these terms will definitely enhance credibility. Market Capitalization, Quarterly/Annual Reports (8-K, 10-K, 10-Q), Dividend, Options, Futures (or future contracts), SEC, NYSE, Hedge Funds, Insider Trading, Venture Capital, Stock Ticker. In addition to the above, there are many other terms specific to different industry sectors. For example, insurance industry has its own terminology like “liability coverage” that an InfoSec professional should learn. Same is true for manufacturing, banking, retail, government, and other industry sectors. I am sure I may have missed many others. If a reader feels strong about any terms (or categories) that should be part of this list, please send your suggestions. 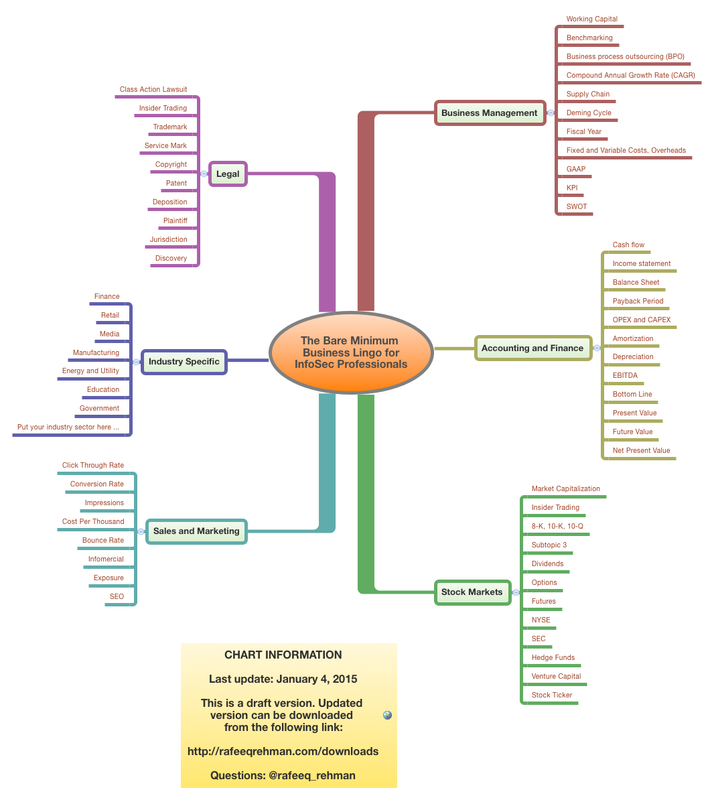 Download PDF Version of this Mind Map from this link. This entry was posted in InfoSec, Leadership and tagged infosec, leadership. Bookmark the permalink.